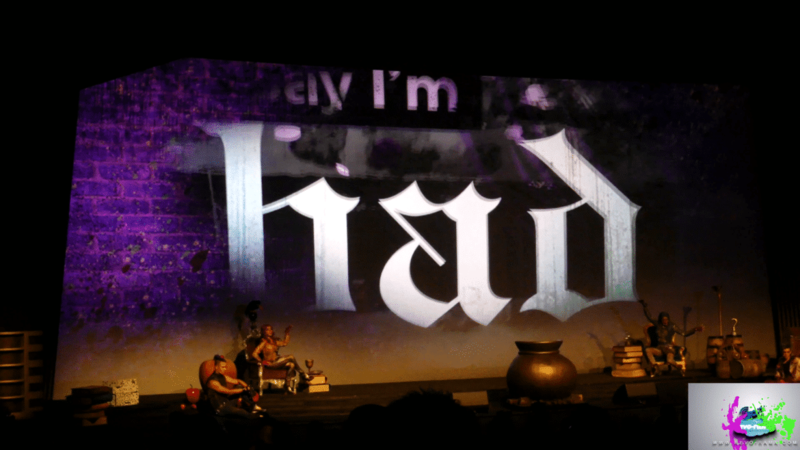 Webzine and Web TV about connected experiences and memories ! 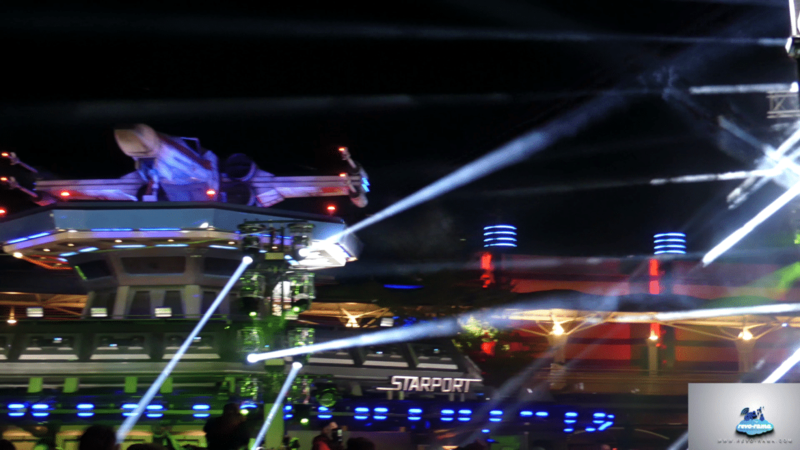 Techno & Family Entertainment, Video Games & Theme Parks … Independently, since 2002! 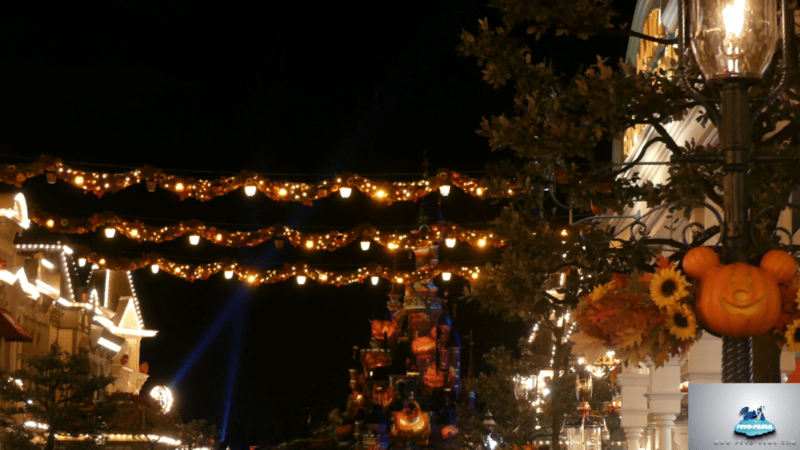 Our family tradition since over 10 years, Halloween is even more important to us than the Christmas season, due to its specific atmosphere, so particular to the Disney parks. 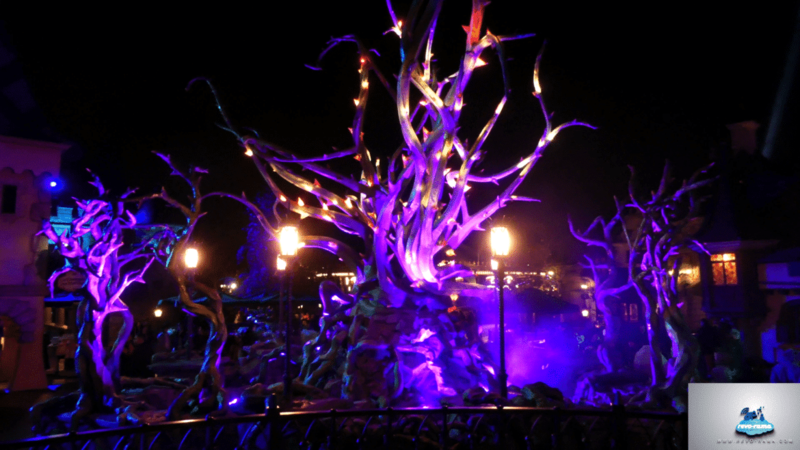 Celebrating Halloween in any other park just wouldn’t be the same. 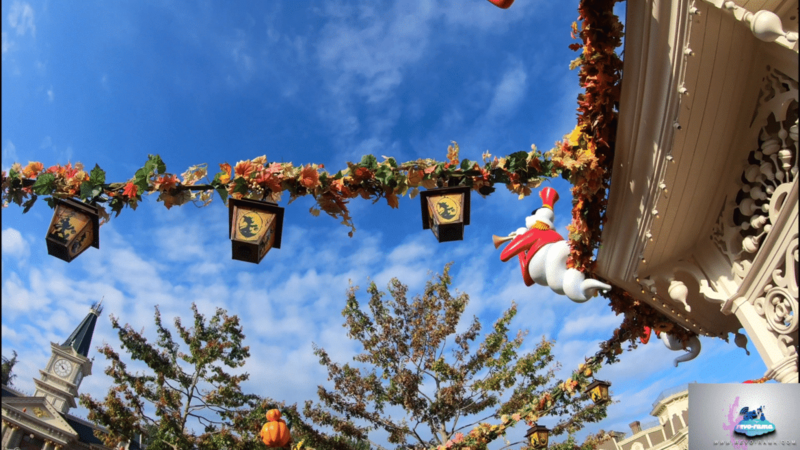 For sure, we know that the celebrations are even more intense in Tokyo Disney or Walt Disney World for example, and we hope that one day there will be enough going on to extend the season to two months, and several parties like with Not-So-Scary back in the days. Last year we were a bit disappointed because the parade had mysteriously disappeared, while we think it’s the best bit of the celebrations. 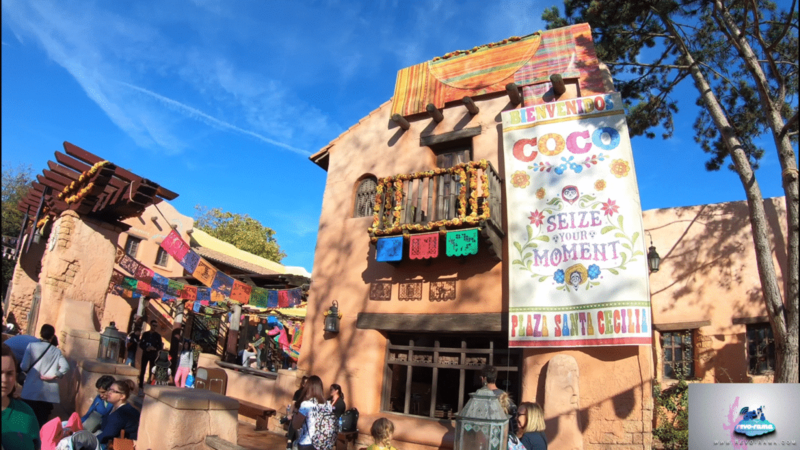 In its place there were new decorations in Frontierland based on Coco and the Dia de Los Muertos. 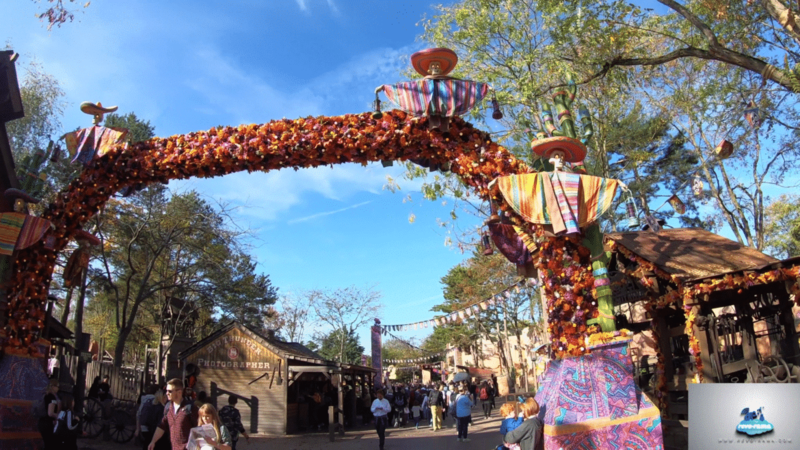 This year, not only did we get these great new decorations which mean that Frontierland is highly decorated, but the parade is also back and with a new float. 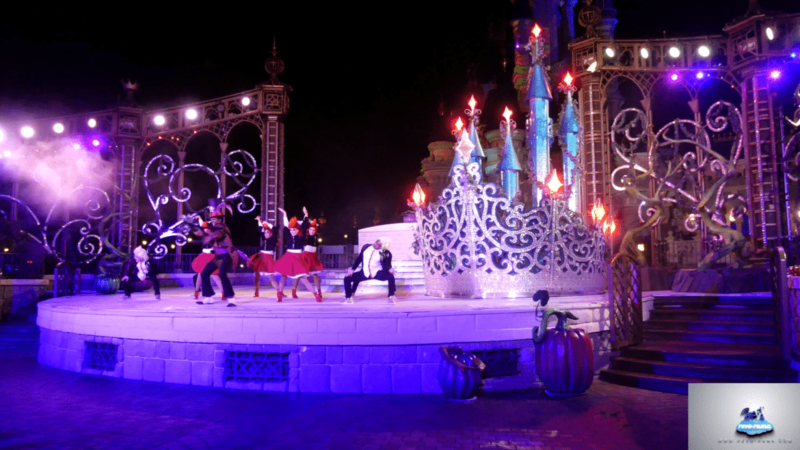 Really beautiful and fun, it brings Phantom Manor and its characters into the show, making it more of a Halloween show than simply the arrival of autumn. 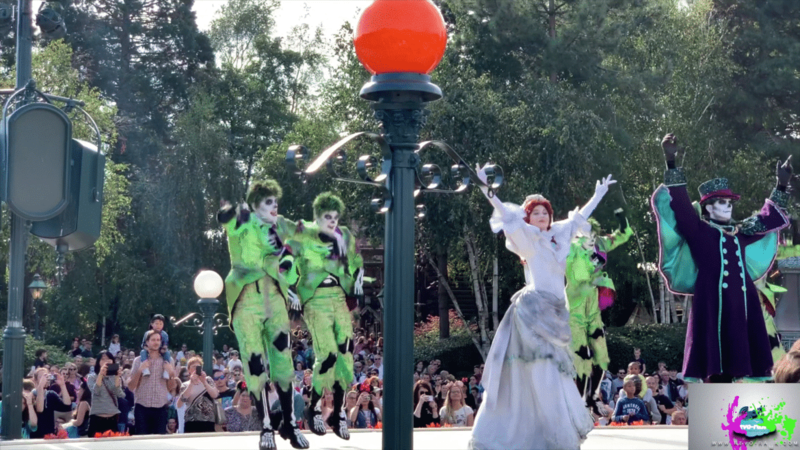 The bride (Melanie Ravenswood) has pride of place in the show, and there was a “Pirates and Princesses” type of stop-off in Central Plaza (the music wasn’t as catchy unfortunately). 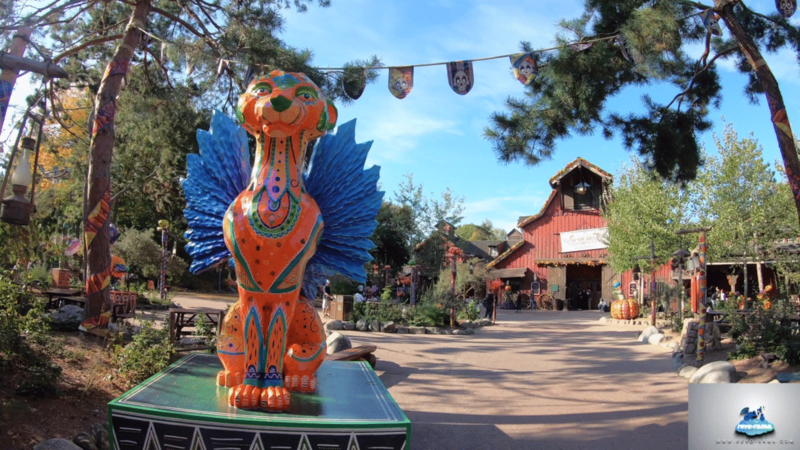 All that’s missing is some great merchandising linked to this attraction (like a bride doll for example!) and of course the re-opening of Phantom Manor which is currently being renovated. The Town Square gazebo decorated for Halloween, with its ghosts. 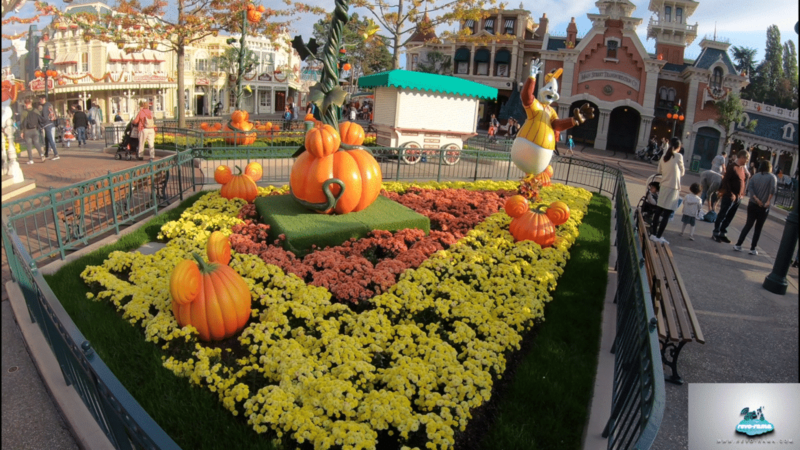 New Halloween garlands in Town Square but especially in Main Street USA. 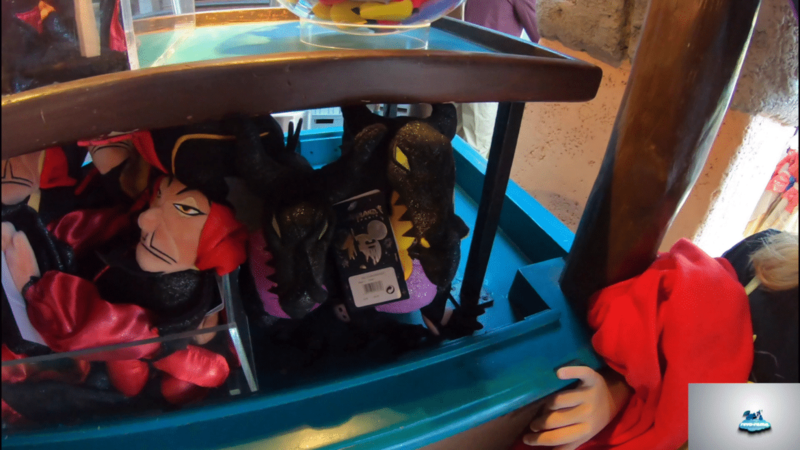 Halloween merchandising at Disneyland Paris: the Ursula Bof doll, the dragon spinning top. 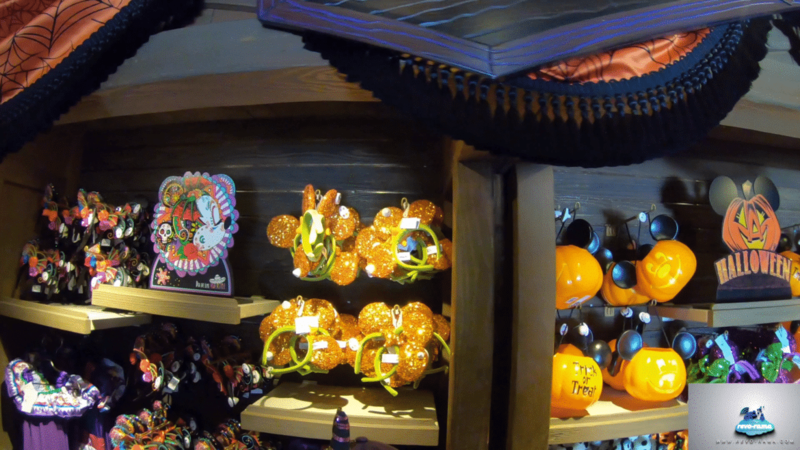 Halloween merchandising at Disneyland Paris. 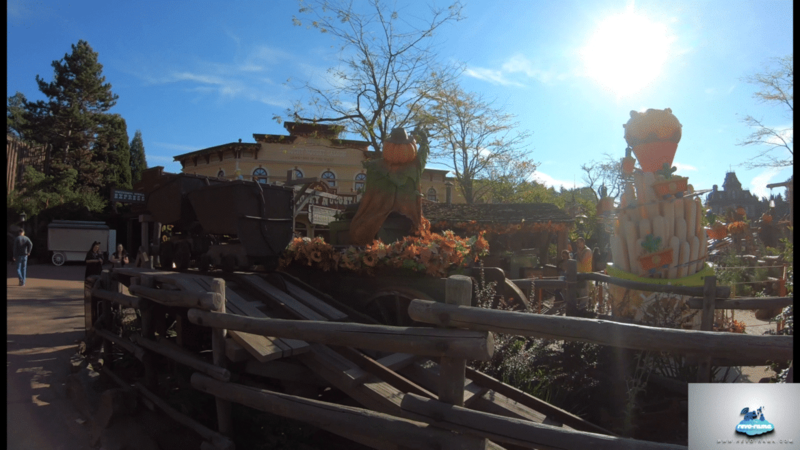 The entrance to Frontierland with its Halloween pumpkins. 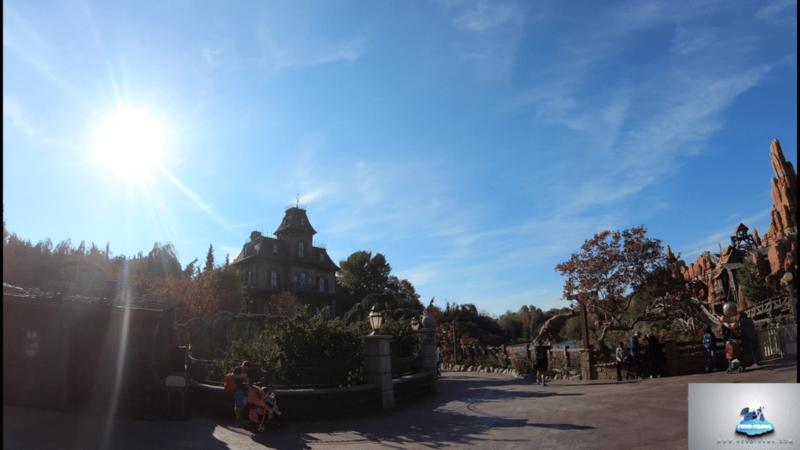 Unfortunately, Phantom Manor is still undergoing renovation. 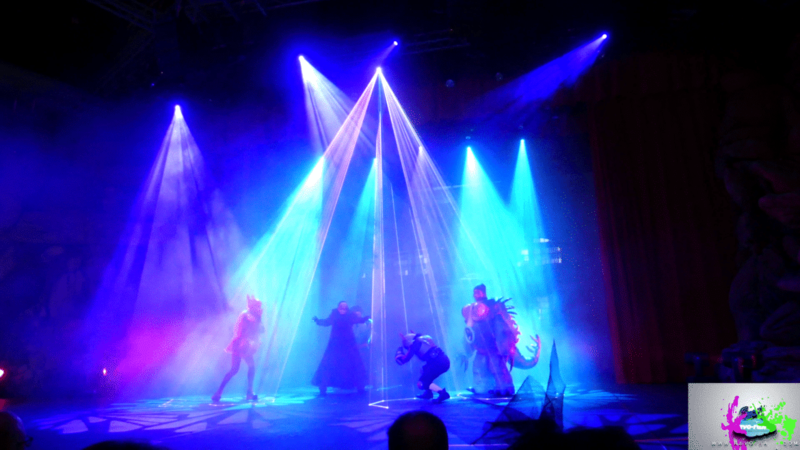 But the daytime festival is missing something of a real Halloween atmosphere, and you need to wait for the evening of October 31st for that. 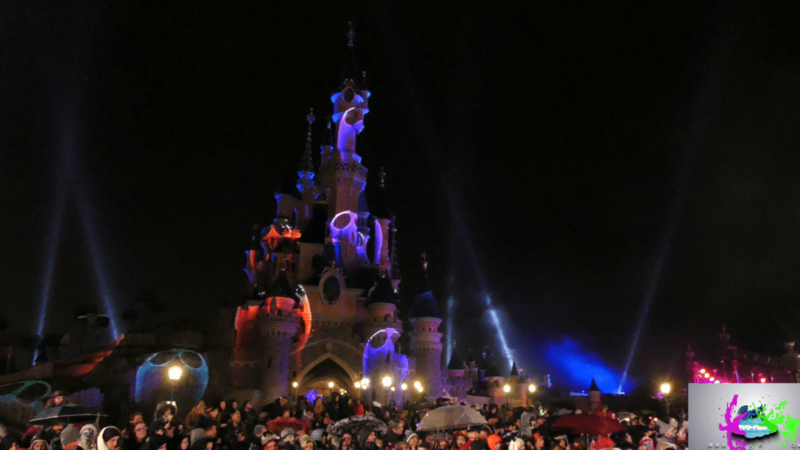 All the best tunes, coming especially from Tokyo Disney and the American parks, are used together with light projections on the castle. 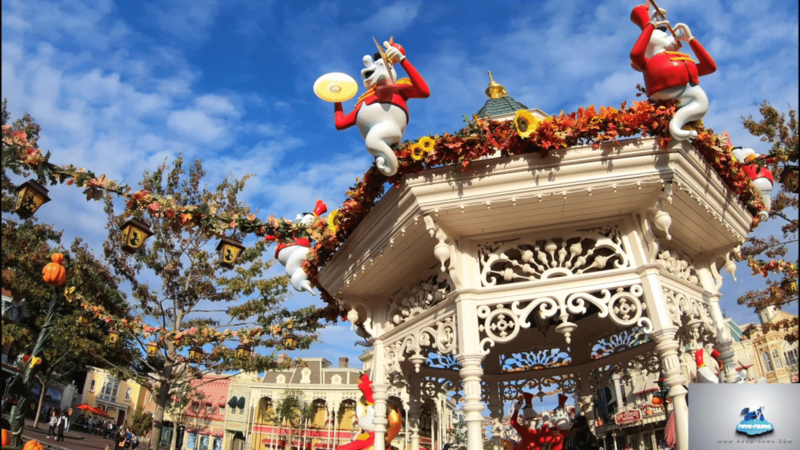 Even the Fantasyland merry-go-round got into the groove. To see it, you’ll need to get your hands on the CD sold by the Japanese park over the years… thumbs up for that great idea. As well as the immersion into party mode, there are a few shows here and there to jazz up the evening (we’ve got to mention the amazing work that went into the beautiful printed programme which was unfortunately distributed very sparingly, even among a group of several people…). 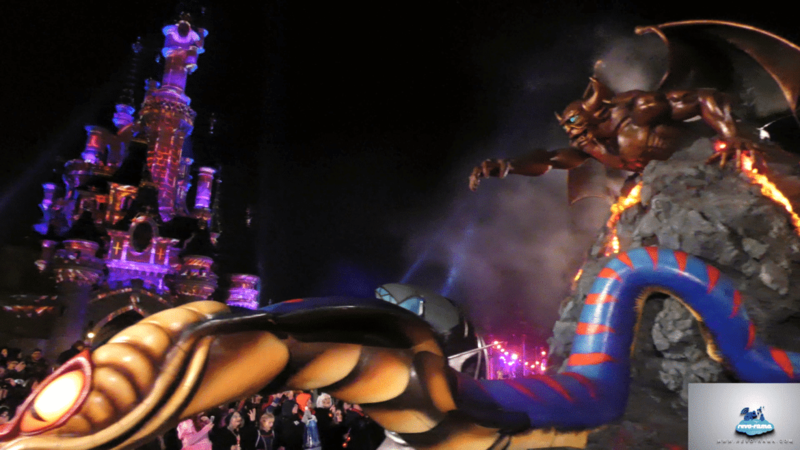 For example the parade was restyled by the Disney villains with the use of one of the old floats from the Once Upon a Dream parade from the 15th anniversary celebrations or the dragon from the 25th. 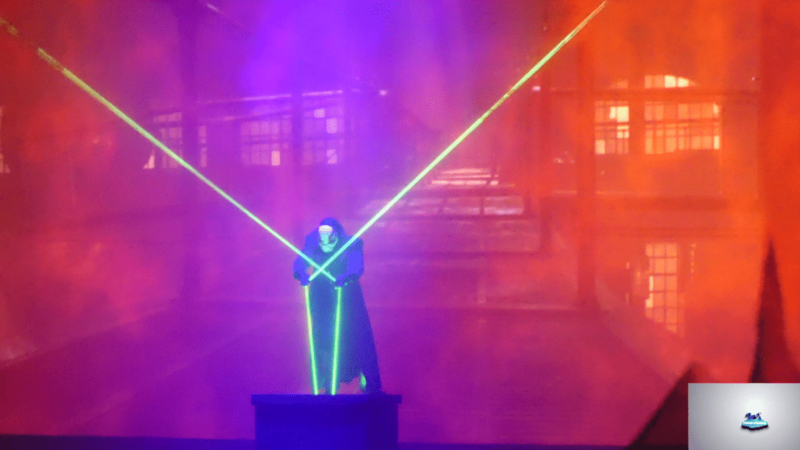 Really nice, although we’d still love to see Fantillusion. 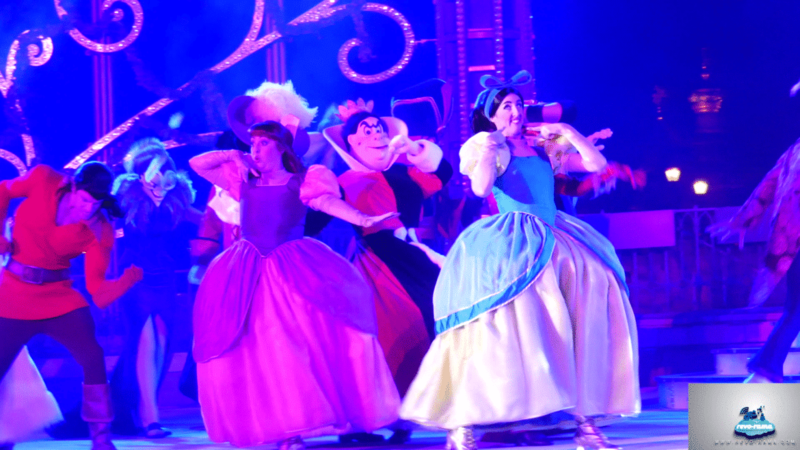 The castle stage show saw Anastasia and Drizella strutting their stuff beside Facilier. 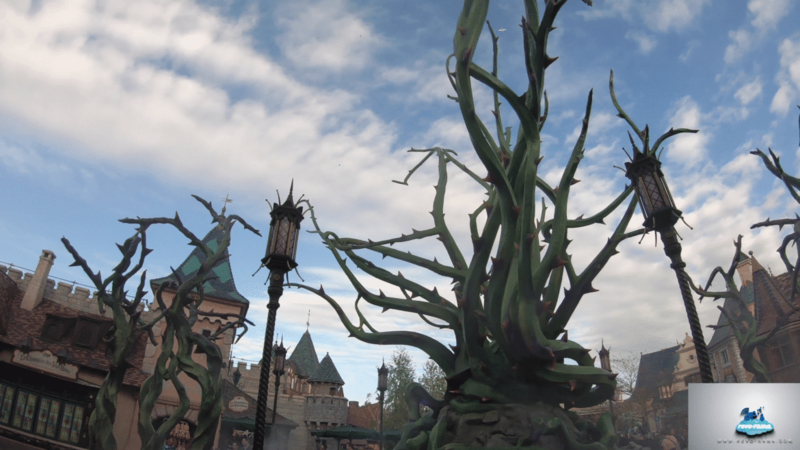 Another new thing was the Spooky Encounters Ashore for the foolhardy (excellent idea), Disney Channel’s Descendent in Sing Along version and Big Hero 6 (we didn’t really see the connection but the show was interesting. They’ll be back on December 31st.). 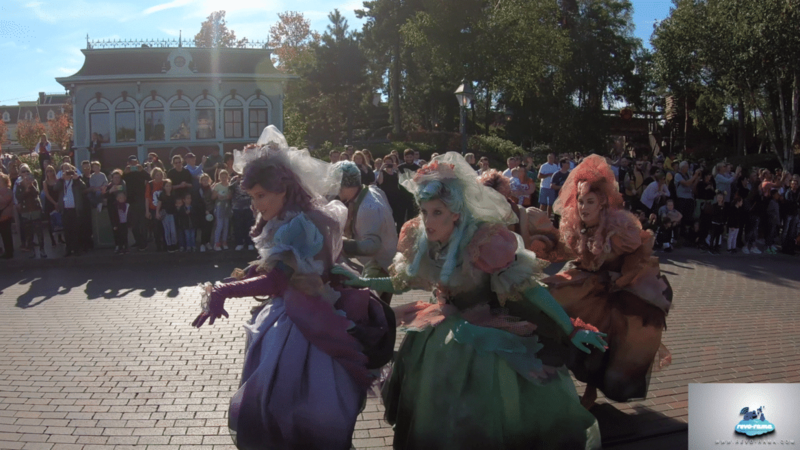 The Phantom Manor ghosts have taken over the Halloween parade. 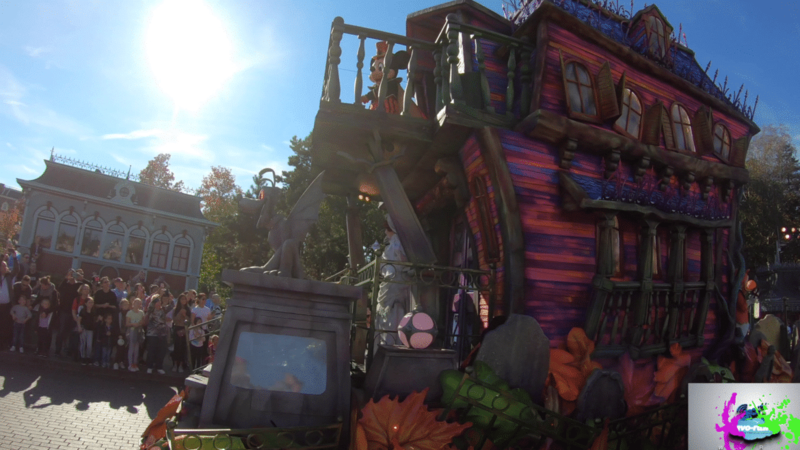 Superb new Phantom Manor float with Mickey and his magic trick. 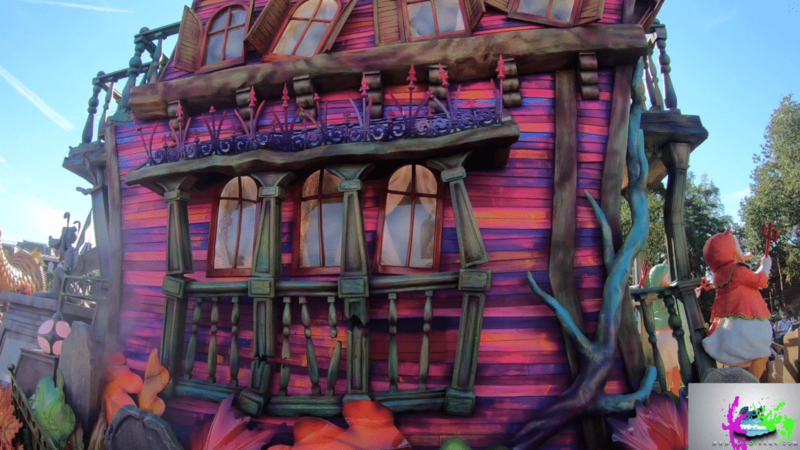 The Phantom Manor float in the Disneyland Paris Halloween parade. 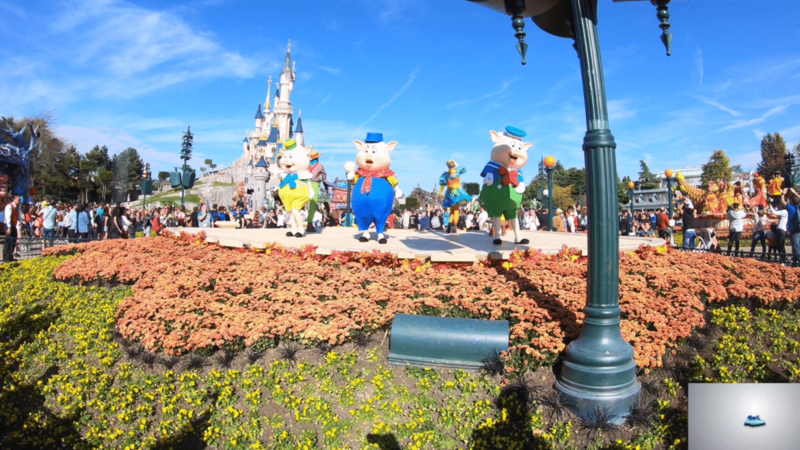 Stop-off at Central Plaza for the Halloween parade with the 3 little pigs. 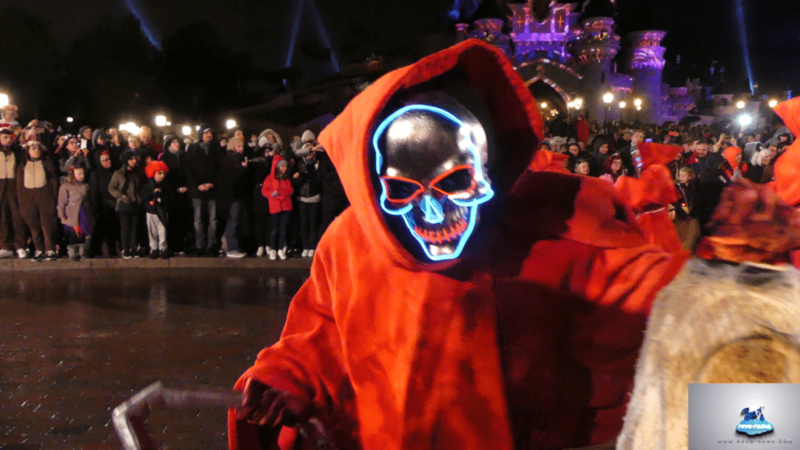 Mickey and his superb Phantom Manor costume during the Disneyland Paris Halloween parade. 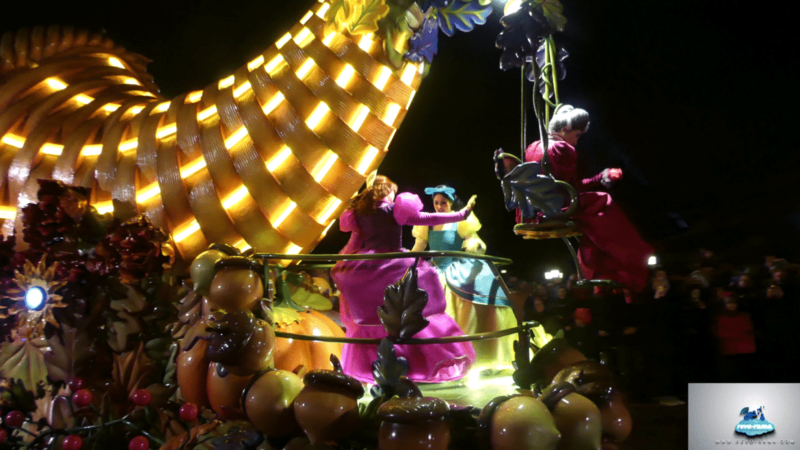 The bride and the ghost, special guests in the Disneyland Paris Halloween parade. And it’s cool! 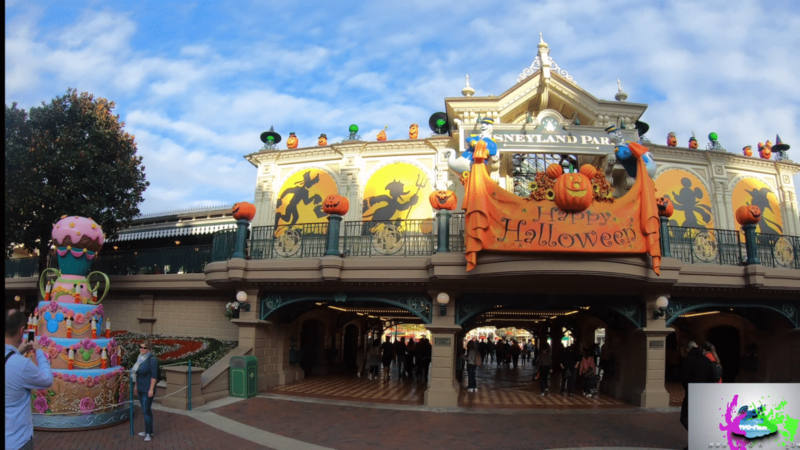 The Halloween garlands on Main Street USA. 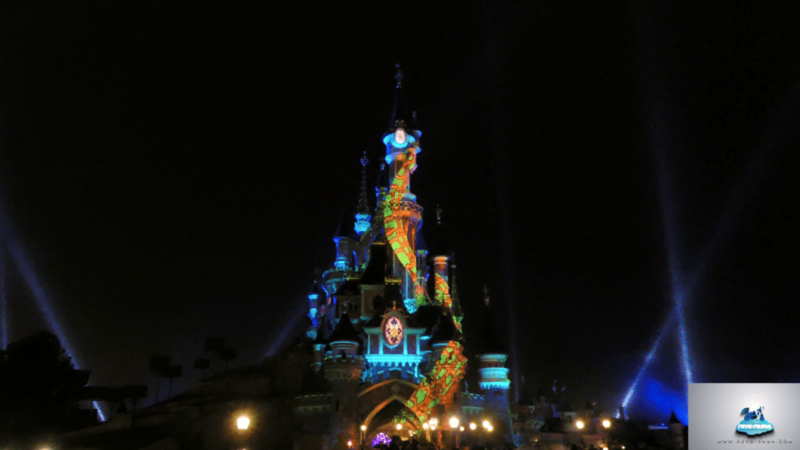 Halloween music and light show on the Disneyland Paris castle during the evening. 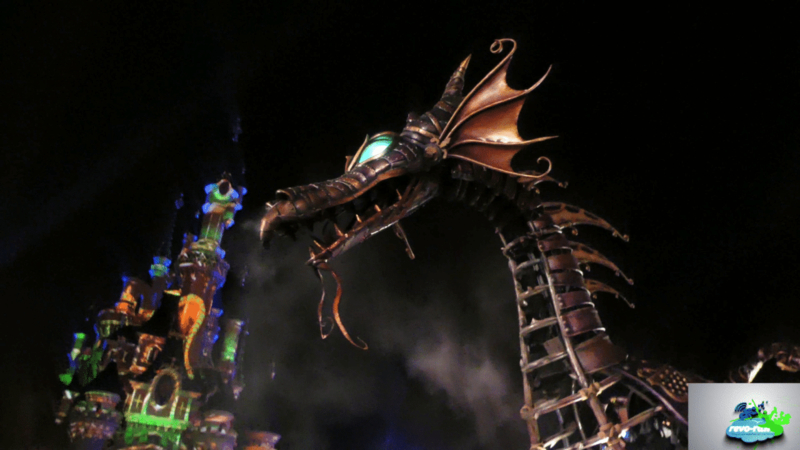 The Disney villains Halloween celebrations: Maleficent. 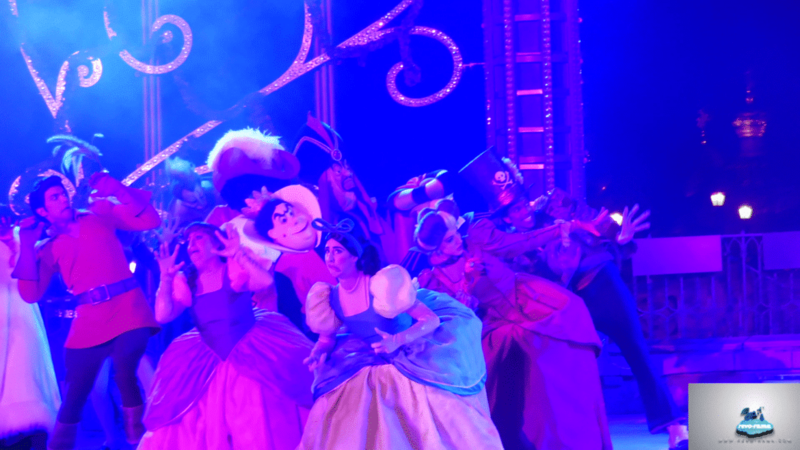 The Disney villains Halloween celebrations: Lady Tremaine, Drizella and Anastasia. 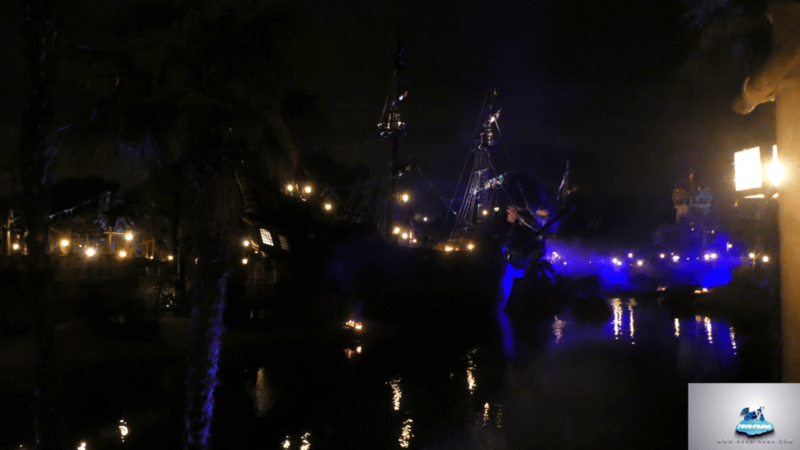 The Disney villains Halloween celebrations: Silly Skeleton. 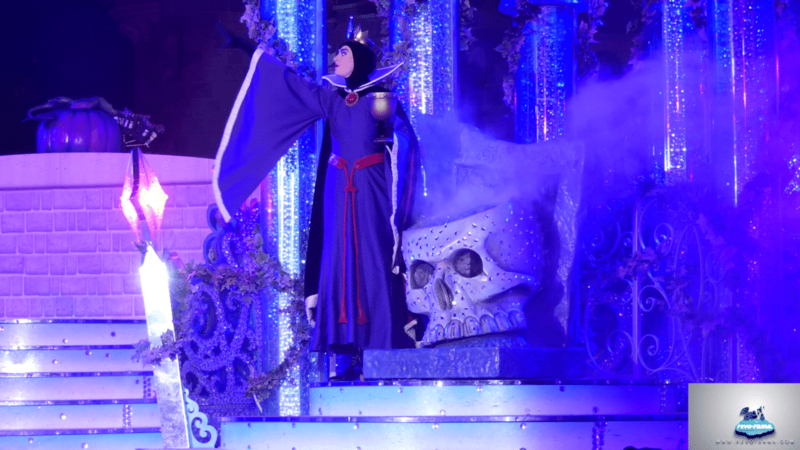 The Disney villains Halloween celebrations: the old float from the Once Upon a Dream parade. 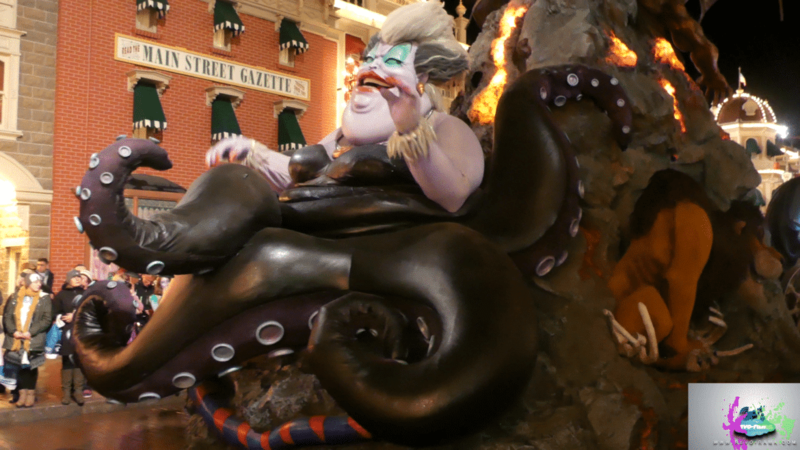 The Disney villains Halloween celebrations: Ursula and Jafar. 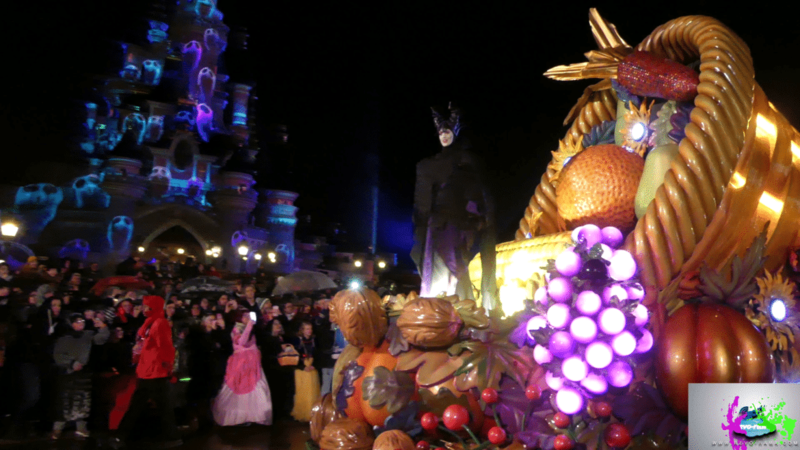 The Disney villains Halloween celebrations: The Stars on Parade Dragon. 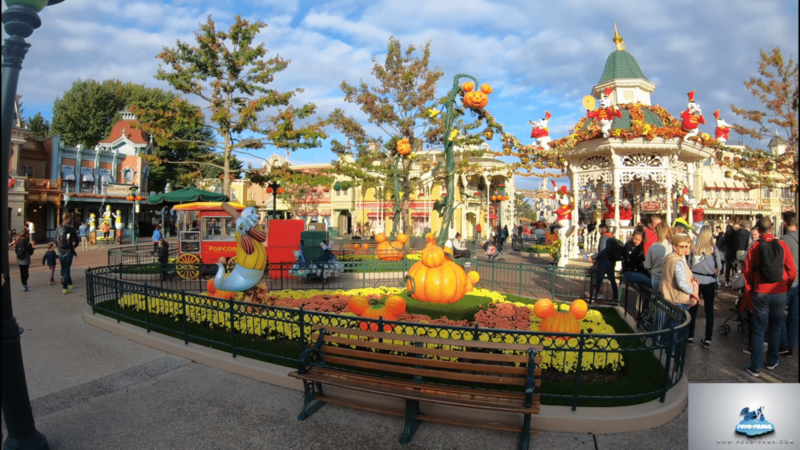 We were glad to see these new Halloween features at Disneyland Paris. There’s been a lot of progress in just a few years, we hope that it will continue to improve this unique experience. 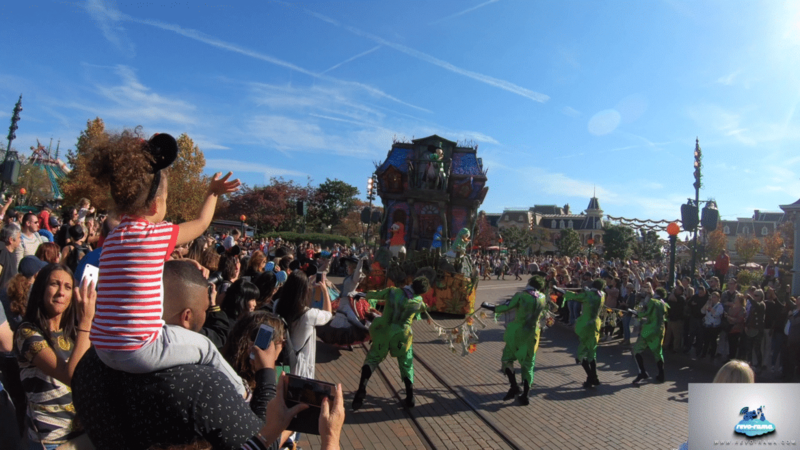 One thing’s for sure, the tradition will continue, and we’ll keep telling you about Halloween in the Disney parks, and others too. 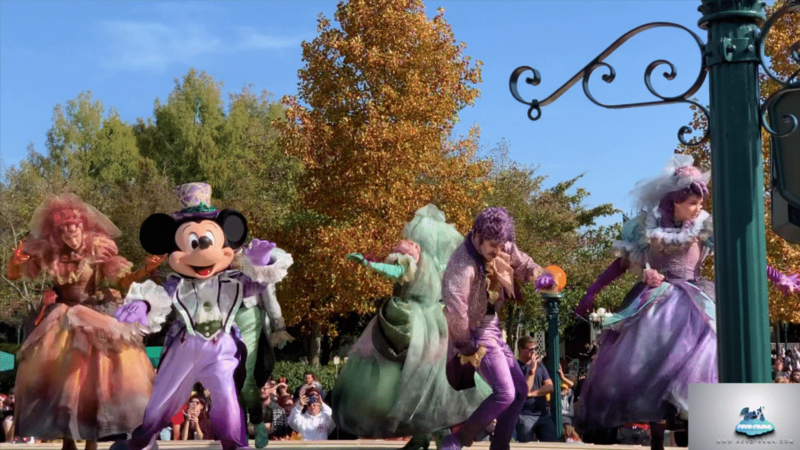 Come and check out Halloween at Disneyland Paris in this video episode of the Revo-Rama! 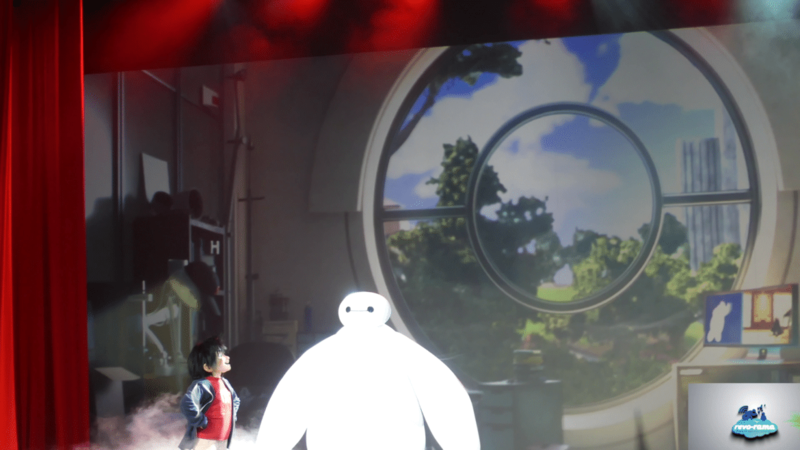 Another surprise: Big Hero 6 for a surprising show in Videopolis for the Halloween party (coming back on December 31st). 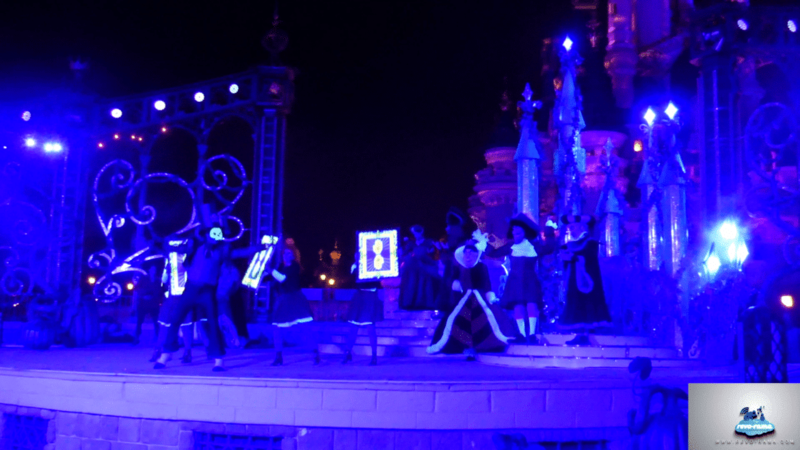 Descendants Sing Along for The Disneyland Paris Halloween Party. 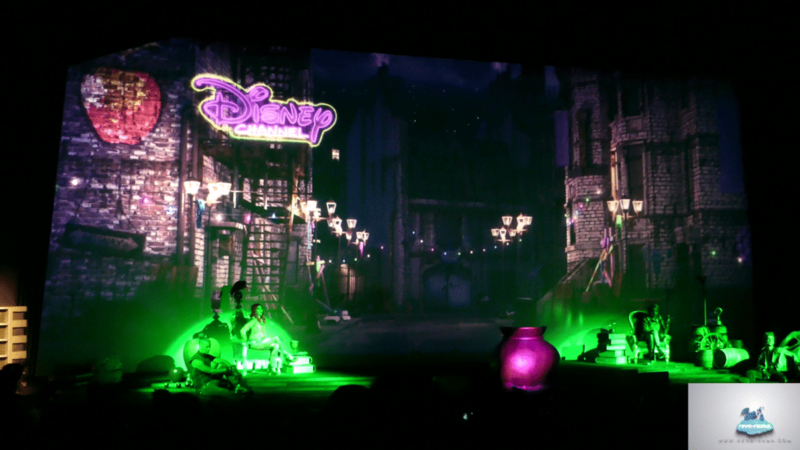 Descendants invited for a (Karaoké) “Sing Along” at Discoveryland Theater. Dance Party with Buzz Lightyear in Discoveryland. 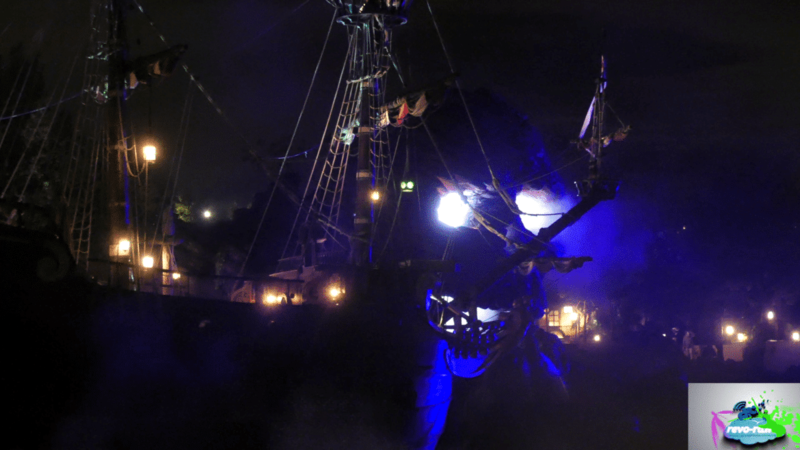 Skull Rock and its beach are transformed for the Disney Halloween party. 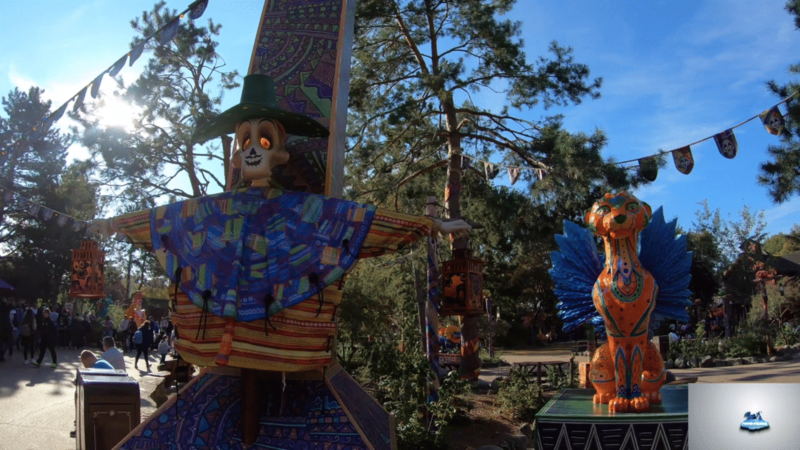 Superb Mystery beach in Adventureland for the Halloween party. 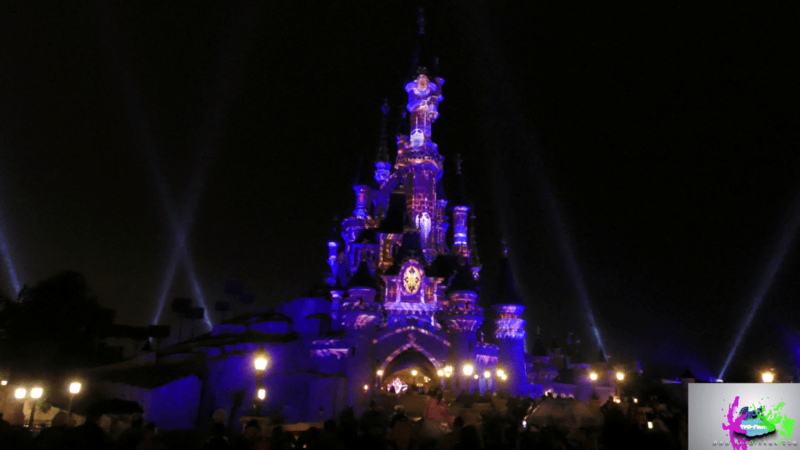 So, what did you think of the Disneyland Paris 2018 Halloween Festival and the Halloween party? 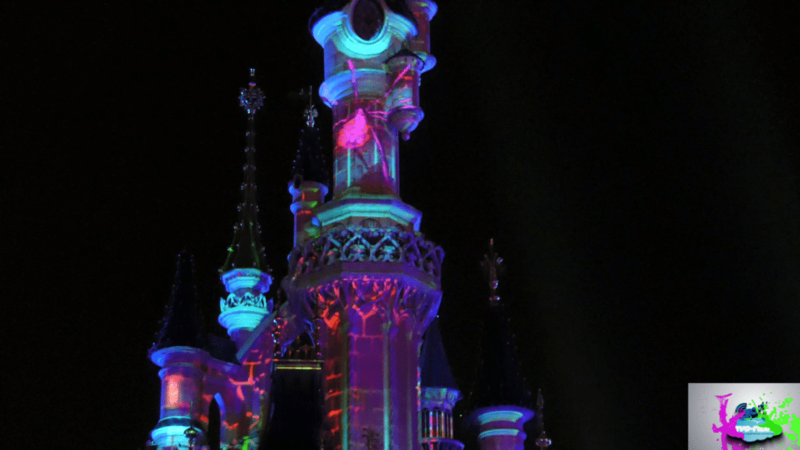 Share the post "Revo-Rama: 2018 Halloween Festival and Party at Disneyland Paris (video)"
About Pascal Kammerer – Freelance Journalist, Videographer and Connected project manager. Thank you for visiting our website. The English language version of this site contains a selection of articles and videos from the original website in French. Please check out the French site and let us know if a particular article is of interest to you.